As you might have heard even if you don’t live in the San Francisco Bay Area, Candlestick Park is going to be demolished soon. Paul McCartney pretty much gave it a send-off on August 14, playing a concert that was as much closure for him (since the Beatles’ last official show was at Candlestick on August 29, 1966) as the city and its residents. I have to admit I hadn’t been to Candlestick for about fifteen years; the Giants moved away at the end of the 1990s, and though the 49ers stayed, I’m not a football fan. The imminent departure made me think about some of the most memorable moments in baseball games I saw in person there, all between the late 1980s and late 1990s. I’m a firm believer that the most interesting things you see at the park are not what are usually blown up as such in the media. All-stars and Hall of Famers setting records, getting retired in sentimental pregame ceremonies, getting standing ovations, winning their twentieth game, or hitting their fortieth homer are actually not the most dramatic occurrences within the games themselves. Those often belong to uncelebrated players in mid-season contests that, in the scheme of who makes the playoffs, are meaningless. I’m celebrating some of those in this post. The most exciting game I ever saw came in the midst of a hugely disappointing season for the Giants — 1996, in which they finished in last place (though they somehow won all five of the games I saw at Candlestick that year). On June 18, they were beating the Florida (as they were then called) Marlins 8-1 going into the bottom of the eighth inning. The Marlins tied it with a huge rally, sending the game into extra innings — the Giants working without Barry Bonds, then in his prime, as he’d been taken out in the eighth inning, the game seemingly in the bag. After a half-dozen scoreless see-saw frames, the Giants won with two outs in the bottom of the fifteenth — on an intentional walk by Pat Rapp. How can that happen, you say? Well, it wasn’t exactly on an intentional walk, but in the middle of an intentional walk to slugger Matt Williams. There was a runner on third, and, unbelievably, Rapp threw a wild pitch while giving Williams a free pass. 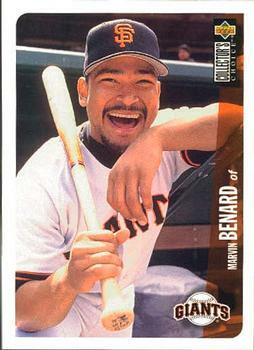 Marvin Benard scampered home, and the Giants were winners, 9-8. How many others times has that happened in major league baseball history? Any? It’s not even the kind of thing you can look up, as it’s simply marked as a wild pitch in the box score, without any note that it was in the midst of an intentional walk. Trying to research this, I couldn’t come up with any other examples, though I did find a somewhat similar incident in a college game between Auburn and the University of Mississippi in April 2014, where an extra-inning game ended when a hitter smacked what was meant to be a pitch from an intentional walk for a walk-off homer. It’s proof of the old adage that no matter how many baseball games you watch, you’re bound to come across something you’ve never seen before. The play at home was close enough, by the way, that had it happened today, the Marlins certainly would have used a replay challenge. I’m not as down on expanded replays as some fans are, but waiting around for a few minutes for the umpires to get the verdict sure would have made the game more anti-climactic than that instant “safe!” call. As it was, I had the suspicion the home plate umpire (it was a day game) was getting hungry and tired, and wanted any excuse to get the thing over with. I would have had a closer view (these being the 15,000-strong-crowd Candlestick days when ushers actually didn’t mind if you sneaked into empty front rows at long games like these), except the guy I was with hadn’t dressed properly for the Candlestick chill, and insisted that we had to stay in seats that were catching some sunlight. Such wet blankets were a factor in another memorable game I saw — the first one I ever saw at Candlestick, actually. 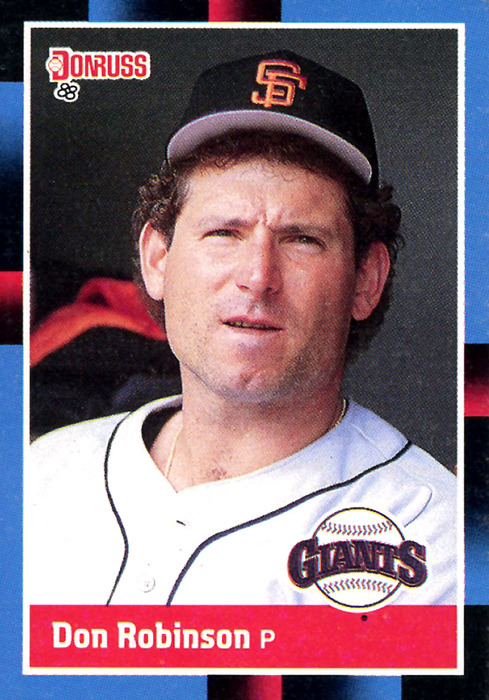 On the night of September 19, 1989, the Giants beat the Dodgers 3-2 on their way to the National League pennant, beating one of the top pitchers of the era, Orel Herschiser. 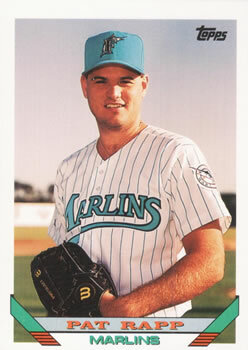 All three runs scored on a three-run double by one of their least heralded bench scrubs, Mike Laga. Laga, who only had twenty at-bats for the Giants that year, was one of those classic AAAA (four-A, quad-A) hitters. With 16 homers in 449 major league ABs, he had some power, but not much else, batting .199, striking out 115 times, and taking only 22 walks. He cranked out 220 homers in the minors, but by 1991 he was playing in Japan, hitting 32 homers (but batting just .236) before getting cut loose after just a dozen games there the following year. But for that one night, he was the big hero. Not that it impressed the out-of-town friend I went with, who spent much of the game (as did many visitors, or even San Francisco residents) complaining about how cold it was. In 1990, I went to about a dozen games, having a job where I worked at home and could often take off for things like this during weekdays. On July 31, the match against the Astros ended on a walk-off pinch-hit single by…Don Robinson, a pitcher. That’s gotta be a rarity, too — a game ending on a pinch-hit by a pitcher. 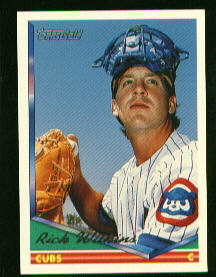 But Robinson was known as one of the very best-hitting pitchers of his time, hitting .231 lifetime with 13 home runs. Robinson’s nickname was “Caveman,” and the friend with whom I attended the game had brought — no joke — a caveman bat into the park the day, on the chance that Robinson just might be pinch-hitting. When Don came to the plate, he waved the stick with gusto. And gleefully took the credit for the win, which was dampened a bit when enthusiastic spectators leaped onto the field to scoop up the ball Robinson had hit, only to be escorted off by police. One of the weirdest plays, and weirdest games, I saw was on June 13, 1996, again against the Astros. 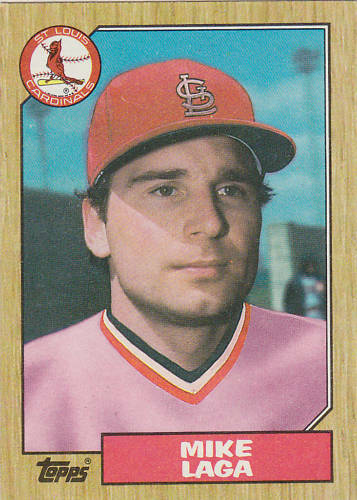 On a third strike to Steve Scarsone, catcher Rick Wilkins failed to catch it on the fly, but had an easy play to throw out the runner at first base. He threw it way down the right-field line, allowing Marvin Benard (there he is again) to score all the way from second, and Scarsone to go all the way to second. It was the most Little League-like play I’d ever seen at a big-league game. That helped stake the Giants to a 9-0 lead, which they almost blew before recovering to win 12-8. More astonishingly, the Giants actually acquired Wilkins later that year, apparently unbothered by his shaky defensive skills. Far better defensive play at the plate was showcased back in 1990 by Steve Decker. I can’t pin down an exact date for this one (even now, when detailed box scores and even play-by-plays for MLB games are on the Internet), though it may have been September 24 against the Padres. As a runner tried to score from third on a flyball, Decker nonchalantly stared ahead as if the ball was nowhere near him — and then grabbed the throw from the outfield and slapped the tag on the runner for an out. 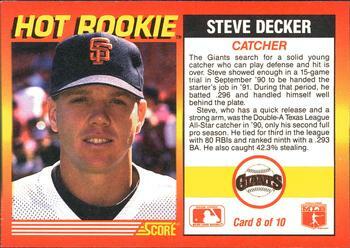 As a September call-up, Decker had a good month, also hitting .296 with three home runs. Great things were expected of him, but he became one of the biggest Giants busts, hitting just .206 in an extended shot at the regular catching job the following year, and never managing to become a regular in the bigs despite playing parts of seven years for four teams. For that one night, though, he looked like an all-star. 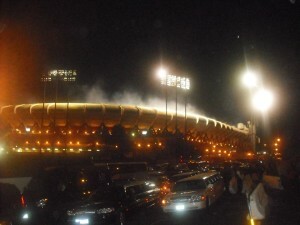 Candlestick was not a good place to see a game, usually. It was often windy and cold, public transportation to the stadium was sparse, and the surrounding neighborhoods were dilapidated (and still are to no small degree). Many locals and out-of-towners greeted the news of its demolition with “it’s about time” or some equivalent. But don’t let anyone tell you that you couldn’t have a good time there if you were a baseball fan (and brought several layers of clothing). Not to mention how you could get a fairly good bleacher seat for $2.50-4.00, almost always get into the park on game day (even if it was sometimes so cavernously empty that you could hear what the players were saying during batting practice), and usually sneak down to better seats on the third-base line without the ushers minding. It might be less windy at the Giants’ current home, AT&T park. But you can’t do any of that there, and probably never will.